Search queries offer a new source of data for many things, even what computational neuroscientists Ogi Ogas and Sai Gaddam call “true” sexual desires. 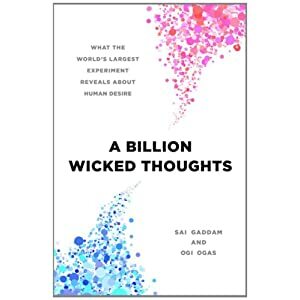 The new book, “A Billion Wicked Thoughts,” co-authored by the duo and scheduled for release on May 5, analyzes 1 billion Web searches from around the world. Aside from the United States, search data now makes it possible to look at sexual behavior with clarity in Saudi Arabia, Japan, India, Germany, Italy, Russia, and other countries. Read the entire article at MediaPost. Any time there is damage to the cell body, the result is cell death. If there is damage to the axon, death is not certain. What kind of recovery can we expect? Neuron regeneration will occur in the Peripheral Nervous System (PNS), but not the CNS (brain and spinal cord). And in the PNS, even if neurons do regenerate, there is no guarantee that they will connect. Just because the potential is there, it does not mean that things will “hook up” correctly. Why no regeneration in the Central Nervous System? No glycoproteins – Growth-promoting glycoproteins are present in the PNS only. Oligodendrocytes – Glycoproteins that inhibit growth are present in the CNS. Remember, oligodendrocytes are a type of CNS glial cell responsible for forming myelin sheath. Schwann cells do this in the PNS. This is seen in transplant studies. When you transplant a PNS cells to the CNS, they do not regrow. When you transplant CNS cells to PNS, they can regrow. Therefore, the ability for these cells to regenerate is dependent on the cellular environment. Studies have found that Brilliant Blue G dye (found in M&Ms) may be beneficial in reducing inflammation, swelling and the formation of scar tissue following a spinal cord injury, allowing more time for treatments. Unfortunately, one of the side effects of Brilliant Blue G is that it turns you blue, as seen in this rat. Testing is still in progress to determine if this treatment can be used effectively in humans. Lesions on spinal cord… Looking for drugs that encourage regeneration by neutralizing growth-inhibiting proteins (MAG and No-Go). Today, we are able to recover some functions, but they are reflexive in nature and happen at the level of the spinal cord, not the brain. For example, increases in stride length versus limb placement (picking up a limb in response to sensory input). This is demonstrated when a paraplegic’s body’s is suspended (body weight supported) and placed on a treadmill using Lokomat system. This activates a reflex as if you are falling, causing you to step forward. With practice, this can be refined, so steps do not appear so robotic. Today, advances in technology have led to robotic exoskeletons that make it possible for some paraplegics to walk again. A sensor is placed on the body that reads signals from the brain transmitted to the nerves, that then activate the exoskeleton to move as desired. Collateral sprouting is when a neighboring cell and move in and form new cell connections, fill vacant cell receptor sites. You see things like Mirror Box Treatments for Phantom Limb Pain, the visual input allows people to feel relaxation. The parts of the brain that process the missing limb are still being activated, where are they getting their information from?